When Android users take their phone out of the box for the first time, things gnenerally work; average users don’t really customize their Android experience but enthusiasts like to hunt for the perfect third-party alternatives to things that they think don’t work. The browser on Gingerbread and below is a good case in point: it’s a lackluster offering that is slow and not customizable at all. Searching for the best alternative browser on Android through Market can be gargantuan task, but if you do your homework you’ll find that Dolphin Browser and Opera Mobile are fan-favorites. We came across a new browser for Android today that we think may just become a fan-favorite. Check it out after the jump! Make no mistake, with over 550 million downloads of its PC web browser Maxthon knows how to make your mobile web sizzle. 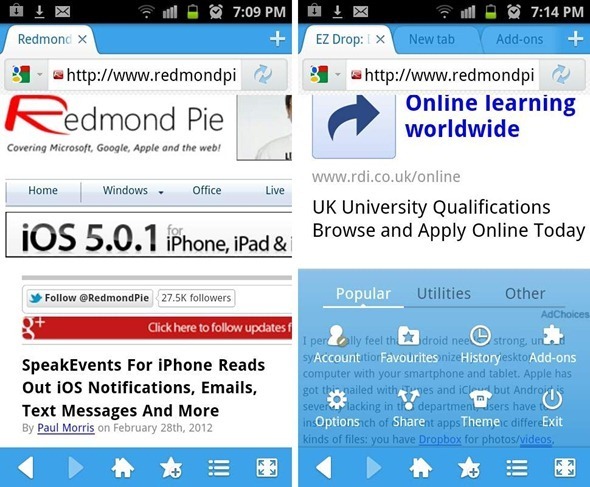 We’ve tested the browser on a Samsung Galaxy S II on Android 2.3 Gingerbread and can confirm that it works as advertised. Maxthon, like its desktop counterpart, is a powerful and flexible tabbed browser. It comes with features like Sync to Cloud (much like Opera Link and Google Sync), private browsing for when you don’t want to leave any browsing tracks on your device, full screen mode so you can make full use of your huge screen, the ability to install a bunch of different add-ons (RSS Reader, Google bookmarks etc.) to enhance functionality and theming just to name a few of the most important features. With such a strong feature-set and smooth user-experience, Maxthon can easily be recommended alongside the other top 3 alternative browsers for Android – Opera Mobile, Chrome and Dolphin. 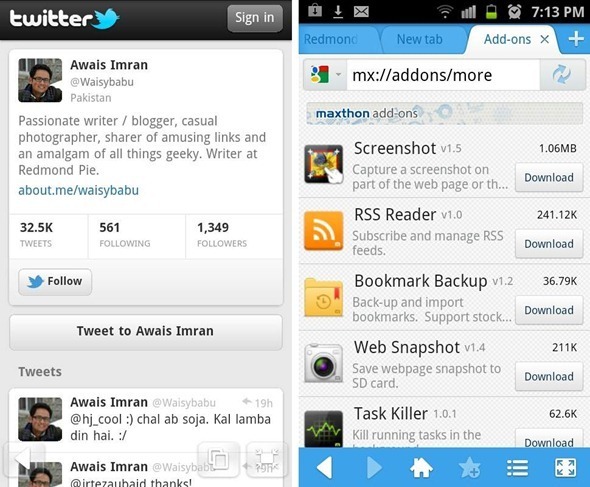 Maxthon Browser is available for free and can be downloaded from the link embedded below. Don’t forget to let us know what you think of it by leaving a comment over on our Facebook and Google+ page!